The movie opens with a glass cage. Two men who apparently know each other wake up chained to either end of a table saw. The puppet "Billy" rides in on a trike and says they each have to decide whether the other guy will die, so that the girl that has been dating both guys is suddenly revealed to be suspended above them will live, or choose to live and let the girl die. The girl tells one man she loves him and the jilted man starts winning. Then she tells the one who is about to die that she loves him and he starts winning. Then they agree to let her die and she is sawed in half, spewing blood out of her mouth and intestines on the floor. Detective Mark Hoffman (Costas Mandylor) escapes from a trap which was attached to his head. He just misses a hiding Jill Tuck (Betsy Russell), and instead focuses on stitching himself up. 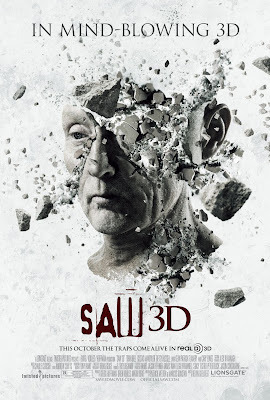 As Jigsaw's ex-wife and with enough familiarity of Hoffman's character, Jill knows that Hoffman will not give up hunting her, and begins making her own arrangements. Heading to the police and requesting a detective not previously involved in the Jigsaw case, Gibson (Chad Donella), she tells him that she has important information and evidence that she will give up only if she gets immunity. Gibson immediately agrees to this.